A driver was hit and hurt by his own broken-down car after a lorry ploughed into it. 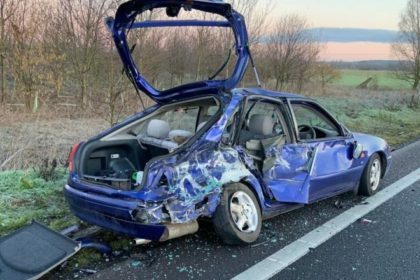 The car had come to a standstill on the inside lane of the A421 close to Great Barford, Bedfordshire, at 07:10 GMT. “Luckily the driver was out of the vehicle” when it was “hit by an HGV who ‘didn’t observe it’,” stated police. The man was treated in hospital for small injuries and the lorry driver was reported to court for driving without being careful and attentive. 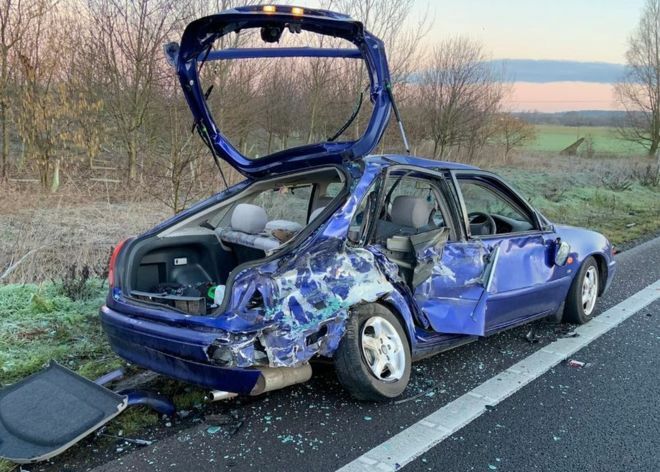 Police stated they had already been called regarding the stranded vehicle on the eastbound section of the dual carriageway, however “a short time later, we got further reports that the car had been involved in a collision with a lorry”. Much of the driver’s side of the vehicle was damaged. The man had already got out of his car, but was damaged by it due to the force of the impact. “[It] goes to show the importance of getting out of your vehicle when broken down,” traffic police stated on Twitter.